New Ranking Methodology for Canadian Universities. 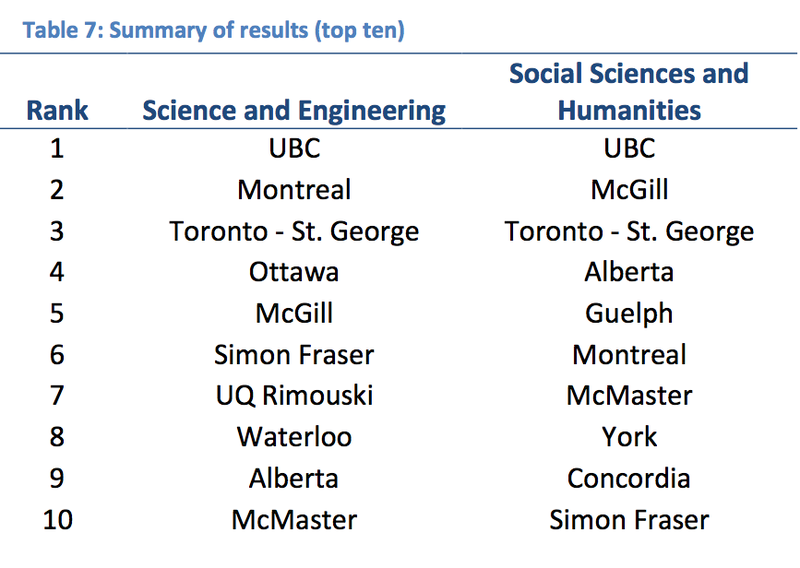 And in other news . . . .
Higher Education Strategy Associates today released a report that proposes a new methodology — “field normalized” — for ranking Canada’s universities. The group aims to mitigate the bias that results from applying the same quantifying methods across disciplines, whether or not these methods in any way reflect what scholars in the fields would use to assess the work of their peers. The group advocates, instead, field-specific parameters. We should judge Arts success according to Arts parameters, and so on. This ensures, they argue, that no school has “an undue advantage simply by being particularly good in a few disciplines with high publication and citation cultures.” The report is timely, given that university administrations are moving to define their institutions around so-called “core values” (or faculties deserving of investment) whose determination may very well be affected by the standard methods of evaluation. The full report is here for those who want to consider the methodology, which is a corrective to rather than wholesale reappraisal of the prevailing protocols. For the University of Alberta, the results are nevertheless interesting, since they challenge the prevailing assumptions of the institution’s strengths. In other news: the U.S. Republican Party’s “platform,” released at the party’s national convention yesterday, calls on “State officials” to refuse to let universities operate as “zones of intellectual indoctrination favoring the Left.” No matter which party wins the American election in November, the Republican Party’s declaration suggests just how much of an opportunity lies before Canadian universities over the next several years: can Canadian universities position themselves as places of intellectual freedom to which the global students that both Canadian and American universities are pursuing should prefer to come? Or to put the matter another way, can Canadian universities achieve a strong, ethical place in university culture worldwide by crucially distinguishing themselves from the American university of the Republican imaginary? If the Republican university would be a place — under colour of a push-back against “ideology” — from which free social thinking is decisively locked out, can Canadian universities in contrast thrive by explicitly presenting themselves as sites for the production of unfettered social thought? That way true innovation lies . . . . This entry was posted in post-secondary education in canada, the north american academy and tagged canadian university rankings, higher education strategy associates, republican party united states, university of alberta faculty of arts. Bookmark the permalink. 2 Responses to New Ranking Methodology for Canadian Universities. And in other news . . . .
Part of me wants to celebrate these HESA findings. Too often we are made to hear that the most socially value research projects within the university are necessarily grounded in industry partnerships and the profit-taking motive, and that “curiosity-driven research” agendas, such as those that abound in the humanities and social sciences, constitute some kind of social luxury. Discursive ammunition of this kind can therefore be useful in our struggle for recognition within our own institution. At the same time, a phrase like this one, from HESA’s description of its methodology – “we measure the depth of their academic capital” — renews my sense that the entire project of comparative metrics resides far from that ideal world of labour solidarity we seek to co-habit with our colleagues in the pure and applied sciences within the U of A, and in the human-sciences in other Canadian universities. Those metrics are now endemic to the corporate university, and I would not want here to lose sight of Sister Outsider and her canonical reminder: “the master’s tools will never dismantle the master’s house.” My own feeling, one I think shared by Arts Squared, is that the best use of such findings – incommensurate as they are with one dominant version of the U of A grand narrative – would be to do away with the entire business of comparative measurements (no more seemly in university administration than they are in teenage boys). And to just let people get on with their work.